If your home doesn’t currently have a gas fireplace, add one! As can be seen in these “before and after” photos from a house in Minnesota, adding a fireplace can have a dramatic effect on a room. Prior to adding the fireplace, the homeowners said the house was very cool in the winter. Not a desirable thing in Minnesota! After spending 17 years in the house, they wanted to be able to enjoy this room all year long – and give it a makeover. The transformation was incredible. Originally blah and uninspiring, the room is now inviting and comfortable – and warm! With the fireplace as the focal point, the homeowners choose cottage-style décor and accents for the room. A simple mantel and surround were chosen to frame the fireplace and add interest to the room. 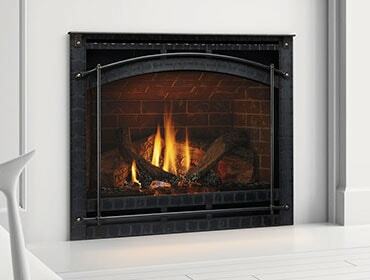 The direct vent gas fireplace the homeowners selected makes having a warm fire quick and easy with a remote control. The homeowners have essentially expanded their home’s usefulness and now are able to use room on a regular basis. The photos really say it all. This is a classic example of how adding a fireplace can complete a home!